The Super Bowl is coming. You’re gonna need salsa. And if you’re gonna bring salsa, you gotta bring it like a MAN. Back in San Francisco, there was a taqueria called Papalote. They had decent burritos, but the thing that kept bringing me back was their crazy delicious salsa. Now that I live on the opposite side of the country, this recipe has held me over. Roasting your own peppers is really pretty easy, if not a little time consuming. All you need is a gas stove (or any broiler) and some tin foil. You steam the peppers in foil pouches for 10-15 minutes after charring them on the stove, then the skin should peel off easily under some running water. Seeding and removing the white pith of the peppers is really easy after roasting. You can use a knife or your hands, but just a quick word to the wise: if you decide not to wear gloves while handling the inside of the jalapeño or the chipotles (which are essentially jalapeños that have been smoked and dried), do yourself a favor and DO NOT rub your eyeball for the next hour or so afterward. Fire-roasting the rest of the ingredients is a little simpler, you just gotta keep an eye on them under the broiler. Cilantro is kind of a controversial herb. People either love it or hate it. I really don’t get the hate, I think cilantro is the best, and you should too. Cilantro is usually pretty dirty when you buy it, so a quick way to wash it is to put it in a bowl, fill it with water, shake the cilantro around and let it soak for a few minutes, then take it out. You’ll see all the dirt and sand that sunk to the bottom of the bowl when you dump the water. Now the fun part. Chop everything up (minus the cilantro), throw it in a food processor, add some lime, and have at it. By the way, if you don’t have one of these lime juicers you do not know what you are missing. Process to a pulpy consistency, chop the cilantro and add that in, then turn the processor back on. This time add a little olive oil while it is processing, similar to making pesto. Place the red bell pepper and jalapeño pepper directly on a stove burner and turn it on to char the skin (if you don’t have a gas stove you can broil them on high as well, but it will take longer to get charred on all sides). Rotate the peppers so each side gets a good char. When the pepper skin is mostly blackened, wrap each pepper in a foil pouch and allow them to steam for about 10 minutes. Meanwhile, place the tomatoes, onion, and garlic cloves on a baking sheet and place on the rack closest to the broiler, and allow to blacken as well. Once the top vegetable skin gets nice and charred, flip them over to allow the other side to cook. The garlic will take much less time than the tomatoes and onion, so flip them first and remove them as soon as their skins get dark. The rest of the vegetables should take about 3-5 minutes each side. Once they are blackened as in the picture, remove and allow to cool. Remove the peppers from the foil pouches, then rinse them under cold water to remove the charred skin. It should come off easily if you allowed it to steam long enough. Cut each pepper in half and remove the pith and seeds (or you can leave the jalapeño whole if you want it spicier). Do the same with the 2 chipotle peppers. Give the peppers, onion, and garlic a rough chop and add to the food processor. Carefully add the roasted tomatoes in whole, skin and all. Squeeze the juice of the lime into the processor. Add salt and pepper, cover the food process and pulse until it looks pulpy. Scrape any large chunks that may have gotten stuck on the sides down into the pulp. 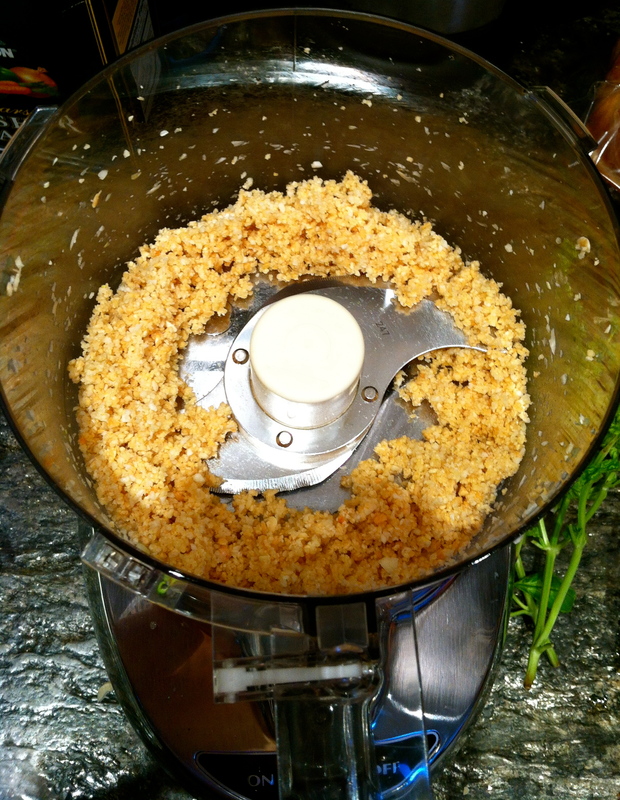 Turn the processor to ON, and while processing carefully drizzle olive oil in a steady stream through the top. The color of the salsa should go from a deep red to an almost creamy orange. Once it gets to that color stop adding oil. Finally give the cilantro a rough chop, throw it in to the food processor and process for another 15 seconds or so until the cilantro is incorporated. Eat with chips or with your next burrito. Sauces and condiments can make almost any dish go from ordinary to delicious. Think about it. What’s a Thanksgiving dinner without turkey gravy? Or Eggs Benedict without hollandaise? Or a Shake Shack burger without Shack Sauce? Yeah I don’t know either. Let me say something else: fellas, do yourself a favor and get yourself a decent food processor. If you hate prep work like I do, then this is a must have appliance for your kitchen. Cuts your chopping, slicing, grating, and mixing time by like 80%. Real talk. I have a 9-cup Cuisinart. Add the basil, arugula, salt, and pepper. Important: Make sure the basil and arugula are washed and dried before placing in the processor. You don’t want watery pesto. While the processor is running, slowly pour the olive oil into the bowl through the feed tube and process until the pesto is thoroughly pureed. Add the Parmesan and puree for a minute. Use right away or store the pesto in the refrigerator or freezer with a thin film of olive oil on top. Notes: Pesto becomes brown and dried out as it is exposed to air. For storing, pack it in containers with a thin film of oil or plastic wrap directly on top with the air pressed out. I had some olives so I also made a simple tapenade after I made the pesto, with a handful of olives, a couple basil leaves, the juice of half a lemon, and a 2-3 cloves garlic, chopped. Again, add olive oil while processing until you get the desired consistency. You don’t even need to clean the bowl! One more thing: do you know how much pesto costs at specialty markets? It’s like $10 for a little 6 oz tub! Get outta my face with that stuff! I made this with basil I had growing in my backyard and I had enough to fill a 32 oz jar. It was basically free. Enjoy!